100 Reasons releases on March 1, 2011. 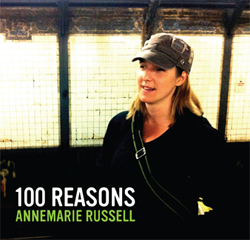 This album is Annemarie Russell's fourth CD, and is produced by New York City area musician Nathan Eklund. Featured on the album are Portland drummer Demetrius Keller, Portland bassist Arcellus Sykes, and guitarists and vocalists Douglas Haub and Jeremy Varo-Haub. Eklund plays horns and additional percussion is provided by Josh Dion, who played drums on The Finest Hour.